(December 6, 2014) The Postal Service exceeded its projections during the holiday season, delivering approximately 524 million packages in December — an 18 percent increase over the previous year. 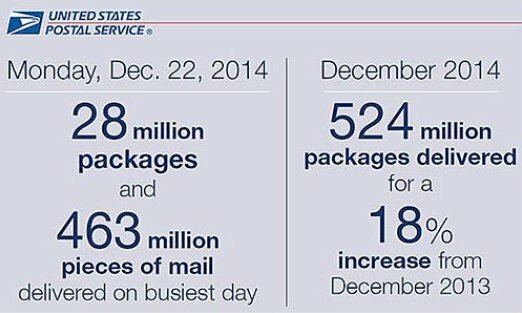 On Dec. 22 alone, USPS delivered more than 28 million packages, the most packages delivered in a single day in the organization’s history. Approximately 463 million mailpieces also were delivered that day. “This holiday season demonstrates retailers and consumers increasingly are turning to USPS to deliver packages,” said PMG Pat Donahoe. The Postal Service prepared for the higher demand by improving tracking and reliability for customers. USPS also delivered packages seven days a week during the season. 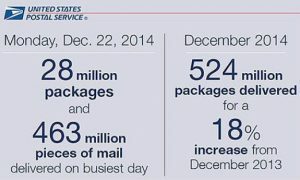 More than 20 million packages were delivered on the five Sundays prior to Christmas. An additional 118,000 packages were delivered Christmas Day. “The dedication and resolve of our employees is commendable,” the PMG said. return unwanted gifts and merchandise through USPS. via USPS News Link – Jan. 7, 2015. This entry was posted in General Union Business and tagged 18 percent increase, 7-day package delivery, Christmas, harsh weather, heavier-than-ever volumes, holiday season, PMG Pat Donahoe. Bookmark the permalink.